Why is it that small things are irresistible, Marta? We used to grow these small bananas in our garden in the islands. How I miss their sweet taste! Great idea about the pound cake and yours is so pretty too. Who wouldn't love a slice. I guess I just get tired of banana bread -- and there's always too many bananas! You're right, Sam, these little guys were so sweet. You grew them?!? Wow! What a perfect cake - love the ingredients and the photo is making me REALLY hungry! 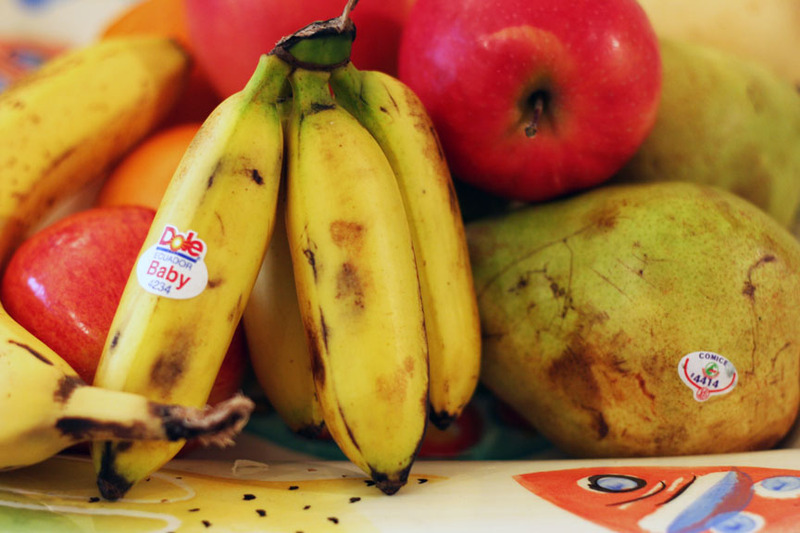 I love those mini bananas - perfect size for kids! What a delicious cake to make with the over ripe ones, looks amazing! They are kid-sized, Erin, and high on the cute factor, too. We go through bananas so fast I have to buy a separate bunch just to make banana treats. I'll have to do that and give this one a go! You're lucky, Carrian. I'm the only one who likes bananas! I am sitting here looking over my computer at some ripe bananas thinking a pound cake might be just the ticket. Yours looks wonderful! Now that I've made this banana cake, I'm ready for a regular pound cake. Rosemary, wow, this looks wonderful! I do get a bit tired of banana bread. I bet you have some great ideas for what else you could do with too many bananas, Chris. This was good, though, and a nice change. Actually, I think I like anything baby! I think I got a little carried away drizzling the glaze, but it was fun! YaY for bourbon! This looks great (and I'm "frugal," too). A hint of bourbon makes a nice difference, Mary! Great use of those cute little bananas. I would love to find some of those in my markets. But I'll try the cake with regular bananas if not. My sister bought them at Wegman's -- there's not one real close to me. I have to settle for "normal," Linda! I love banana desserts. I'm glad you went the pound cake route instead of banana bread. I have nothing against banana bread, but it's always nice to see someone try something else and I LOVE pound cake (and I'm digging the bourbon in there too). My all time favorite banana dessert is bananas Foster, especially if I get to go to New Orleans to have it! This is a fantastic way to use up overripe bananas. I'd love to sit down with a slice of this cake and a cup of tea. The cake was a nice change from banana bread. Thanks for visiting, Dara. There's something so much more sophisticated about banana cake versus banana bread. And, I love the cream cheese icing - very nice! Maybe that's what struck me, Susan . . . I'm glad that cook created this cake! Yep . . . beats banana bread hands down. I think banana pound cake sounds delicious-I am one of those people who forever make banana bread with my overripe bananas. I need to up the anty on this one. A good change of pace, although my granddaughter will always opt for banana bread. Anything with bananas and I am always happy! Your cake looks amazing and very delicious...I love the recipe! Have a wonderful weekend!!! The cake was prettier in real life. Pretty rich though. Glad I was able to share it with neighbors. I'm surprised how much I liked this cake, Mary. A keeper -- for the next (inevitable) time I have too many bananas! Hmmm, I have too ripe bananas and this sounds like a wonderful way to use them. I love pound cake so your recipe seems a nice change from the traditional banana bread. Making the cake this morning. Question....please verify you baked the cake at 450...seems a pretty high temp. Also....did you glaze with powdered sugar mix or a cream cheese icing? If cream cheese, would you please share your tips for making it. Can't wait to try a piece of this warm cake on a cold Michigan morning. The temperature should be 325 degrees. Hope you trusted your instincts. It was a great cake. I used a simple confectioner's sugar glaze - just thinning confectioner's sugar with a half-and-half until the right drizzling consistency. Thanks so much for letting me know about the temperature.